Update (8/16/2017): Additional information on each country’s profit shifting rules has been added to the body of the text and the appendix. A central goal of corporate tax reform is to fix the U.S.’s system for taxing the foreign profits of domestic businesses. Many lawmakers have sought to reform the corporate tax by moving to a “territorial” tax system, which would exempt foreign profits of U.S. multinational businesses from domestic taxation. Over the past 30 years, the vast majority of America’s largest trading partners have moved to territorial tax systems. The territorial tax systems throughout the 35 member nations of the Organisation for Economic Cooperation and Development (OECD) vary substantially in scope and design. All OECD countries with territorial tax systems have designed provisions that seek to prevent base erosion and profit shifting by multinational corporations. Designing a territorial tax system requires balancing competing goals: completely exempting foreign business activity from domestic taxation, protecting the domestic corporate tax base, and a simple system. A system can generally only choose up to two of these. Moving to a territorial tax system would improve the U.S. corporate tax system. However, corporate taxation is inherently complex and lawmakers will need to carefully consider how to structure a territorial tax system for the United States. There is broad agreement that the current system for taxing the foreign profits of U.S. multinational corporations is broken. Under current law, the United States taxes the worldwide income of resident multinational corporations. This means that so long as a corporation is considered a resident in the United States, all its earnings are subject to U.S. tax of at least 35 percent regardless of the location of those earnings. Foreign earnings, however, are not taxed until they are repatriated or brought back to the United States. There are downsides to this system. The U.S. worldwide tax system discourages companies from repatriating foreign earnings, causing what some call the “lock-out effect.” Companies make inefficient financial arrangements and investments to avoid repatriating this income and facing additional U.S. tax. In some cases, the system incentivizes companies to avoid the domestic tax on their foreign profits by moving their corporate headquarters out of the United States. As a result, the U.S. worldwide system has been one of the major drivers of corporate inversions in the last few decades. From an economic standpoint, the U.S.’s worldwide tax system discourages outward foreign investment. Finally, on a normative level, it may be philosophically objectionable for the U.S. government to tax income earned in other jurisdictions. Over the past decade there have been several tax reform proposals that aim to deal with the issues with our international tax system. The most recent tax proposal, the House GOP “Blueprint,” proposed replacing the corporate income tax with a “destination-based cash-flow tax” (DBCFT). This would eliminate most of the current distortions caused by the U.S. worldwide tax system and the corporate income tax in general. More traditionally, many lawmakers have proposed replacing the worldwide system with what is called a “territorial” tax system. A territorial tax system taxes companies based on the location of profits rather than corporate residence. This means that U.S. companies that earn profits overseas would no longer face an additional U.S. tax on those profits when they are brought back to the United States. A well-designed territorial tax system would improve and address several problems with our current international tax system. Taxation would no longer be based on residence, so companies would no longer gain significant benefit from inverting. Companies would no longer be discouraged from investing and expanding operations throughout the world. Lastly, a territorial tax system would eliminate the “lock-out” effect, and capital would flow more freely back to the United States. However, a challenge with territorial corporate income taxes is that they can be complex. The goal of a territorial tax system is to tax companies based on the location of their production, which is challenging in today’s highly globalized world. This is because production processes stretch across numerous jurisdictions and can include transactions that are difficult to price. Companies with multinational production processes take deductions and report revenues throughout the world to allocate their profits. As such, it is often difficult to determine exactly how much profit should be taxed in a given country. It is also a concern that territorial tax systems can be subject to base erosion. The fact that production processes span multiple tax jurisdictions leaves room for companies to take advantage of country-level differences in tax policy to allocate revenues and costs across tax jurisdictions in a way that can limit their worldwide tax liability. And because companies no longer face an additional tax on foreign profits that are repatriated to the parent company, multinational corporations would have a greater incentive to avoid U.S. tax. Due to these concerns, countries with territorial corporate tax systems set up rules to define how and if foreign profits are taxed, as well as rules that prevent base erosion and profit shifting. Territorial corporate tax systems can end up reflecting the complexity of the business models of multinational corporations. This paper reviews how the 35 countries within the Organisation of Economic Cooperation and Development (OECD) structure their territorial tax systems and construct base erosion rules. It also reviews two past U.S. proposals to move to a territorial tax system. In addition, it analyzes the inherent trade-offs that lawmakers would need to make in designing a territorial tax system for the United States. Anti-base erosion rules and the extent to which countries exempt foreign profits from domestic taxation vary significantly from country to country. It is not clear that a “perfect” or pure territorial tax system exists. Rather countries need to trade off among three key goals: eliminating taxes on foreign profits, protecting their tax bases, and making their tax codes as simple as possible. Lawmakers will need to consider these trade-offs if they pursue a territorial tax system for the United States. Over the last three decades, most OECD countries have shifted towards territorial tax systems and away from residence-based or “worldwide” systems. The goal of many countries has been to reduce barriers to international capital flows and to increase the competitiveness of domestically headquartered multinational firms. As part of setting up these territorial tax systems, countries constructed rules that determined when and if foreign profits would be exempt from taxation. They also put in place and strengthened rules that attempt to limit potential profit shifting. There are basically three major aspects that define the scope of a country’s international corporate tax system. First are what are called “participation exemptions.” Participation exemptions are what create a territorial tax system. They allow companies to exclude or deduct foreign profits that they receive from foreign subsidiaries from domestic taxable income, thus exempting those profits then from domestic tax. In contrast, a worldwide system has no or few participation exemptions, and subjects those profits to domestic taxation. Second are controlled foreign corporation (CFC) rules. The aim of these rules is to discourage or prevent domestic multinationals from using highly mobile income (interest, dividends, royalties, etc.) and certain business arrangements to avoid domestic tax liability. They work by defining what constitutes a “controlled” foreign company and when to attribute foreign income of these controlled companies to a domestic parent’s taxable income. Third are limitations on interest deductions. These rules are used to prevent domestic and foreign companies from using interest expense deductions to shift profits into low-tax jurisdictions. While these rules do not directly impact foreign profits that multinationals earn in foreign jurisdictions, they are an important part of most countries’ corporate tax systems and are aimed at preventing significant base erosion. Countries enact territorial tax systems through what are called “participation exemptions” or dividend deductions. Participation exemptions eliminate the additional domestic tax on foreign income by allowing companies to either ignore foreign income in the calculation of their taxable income or to deduct foreign income when it is paid back to the domestic parent company. Participation exemptions can also apply to capital gains. Companies that sell their shares in a CFC and realize a gain may face no tax on those gains. Some countries, such as Iceland, grant full exemptions for both foreign capital gains and foreign dividend income earned by domestic corporations. Other countries offer exemptions for one type of income, but not the other. Slovakia, for instance, offers a full exemption for dividend income received from foreign subsidiaries, but taxes capital gains realized from the sale of a foreign subsidiary as ordinary corporate income. Of the 35 OECD member states, 29 countries offer some exemption or deduction for dividend income and 26 countries offer an exemption for capital gains, with 25 countries offering an exemption or deduction for both. Participation exemptions also range from full to partial deductibility or excludability. For example, France exempts 95 percent of foreign dividend income and 88 percent of foreign capital gains. Countries providing partial exemptions often do so because it is less complex than accounting for business expenses that don’t directly correlate to physical production. Usually companies are required to allocate overhead costs of their headquarters, such as office supplies, to foreign subsidiaries. Allocating these costs can be complex. So instead of writing rules requiring companies to allocate expenses, countries allow companies to deduct those costs domestically, but tax a small portion of their foreign profits instead. While most countries have enacted participation exemptions to eliminate the domestic tax on foreign profits, these exemptions are not unlimited. Countries have a range of rules that determine whether foreign profits are subject to tax when repatriated or paid back to their domestic parent. Many European Union (EU) member states offer exemptions only when the resident company holds at least 10 percent of the subsidiary’s share capital or voting rights for some specified period of time. France and Germany are notable exceptions, with France requiring only a 5 percent holding, and Germany unconditionally exempting 95 percent of foreign capital gains. Countries also limit participation exemptions and dividend deductions based on foreign subsidiaries’ location. EU member states typically limit exemptions to subsidiaries located in other EU member states or within the European Economic Area (EEA). Some countries publish a “black list” of jurisdictions where the tax regime is considered abusive, and will not provide exemptions to profits earned in those jurisdictions. Others, such as Norway, impose a standard for how high a corporate tax rate subsidiaries must pay abroad in order to qualify for a participation exemption. This directly excludes companies paying low effective rates from receiving an exemption. Some countries have restrictions based on the line of business a foreign subsidiary is in. For example, several countries that exempt most dividend income will not exempt profits derived from certain service-based subsidiaries, such as law offices. A common concern with moving to a territorial tax system is base erosion. Under a territorial tax system, companies no longer face an additional tax on foreign profits that are repatriated to the parent company. Thus, it’s thought multinational corporations would have a greater incentive to avoid domestic tax liability by using transactions to shift income to foreign subsidiaries in jurisdictions with lower tax rates. Countries set up anti-base erosion rules called “CFC rules” as a way to address base erosion. These rules aim to discourage or prevent domestic multinationals from using highly mobile income (interest, dividends, royalties, etc.) and certain business arrangements to avoid domestic tax liability. CFC rules are designed to prevent profit shifting without penalizing foreign subsidiaries engaged in legitimate business practices. CFC rules are not unique to countries with territorial tax systems. Countries with worldwide tax systems use them to prevent companies from indefinitely deferring profits they suspect were shifted out of the domestic tax base. In the United States, CFC rules are called “Subpart F” rules. CFC rules generally outline policies for taxing the undistributed income of a domestic corporation’s foreign subsidiaries. This means that if a foreign subsidiary of a domestic parent corporation is deemed a CFC and subject to a country’s CFC rules, all or a portion of its profits are immediately subject to domestic tax. The income can either be taxed separately from domestic income, or it can be incorporated into the taxable base of the domestic parent corporation. For example, a British corporation may own a subsidiary located in the Netherlands. If the British CFC rules determine that the Dutch subsidiary is a CFC and the rules determine that it may be involved in profit shifting, the Dutch subsidiary’s profits are immediately taxed in the United Kingdom. CFC rules are very common throughout the OECD. Only 10 OECD members do not have any formal CFC rules. However, these countries often have other more qualitative base erosion provisions that attempt to accomplish the same goal as CFC rules. CFC rules, while complicated and highly variable, all follow a basic outline. First, an ownership threshold or test is used to determine whether an entity is considered a CFC. Next, a second tier of standards is used to determine if the CFC is taxable in the parent company’s country. Finally, the rules determine what types of income are taxable. The first set of rules is meant to determine whether a foreign corporation is “controlled.” The idea being that if a foreign company isn’t controlled by a domestic corporation, the domestic corporation isn’t necessarily responsible for profit shifting that may be occurring. What constitutes control varies by country and some countries have ownership thresholds that more easily trigger CFC status than others. The most typical determination is a 50 percent shareholding threshold. Eighteen OECD countries use this standard. This means that if one or more related corporations together own more than 50 percent of a foreign corporation’s shares, that corporation is a CFC. For example, if a Finnish corporation independently owned 30 percent of shares in a foreign subsidiary and two of its domestic affiliates owned another 40 percent of shares in the subsidiary, then the foreign subsidiary would be considered a CFC. Some countries narrow the scope of CFC determination by combining these total ownership thresholds with single-ownership thresholds. Single-ownership thresholds apply to the level of ownership for a single corporation. For example, the United States combines its 50 percent ownership threshold with a 10 percent single-ownership threshold. This means that a foreign entity is considered a CFC if 1) more than 50 percent of the shares are owned by a U.S. corporation and its affiliates and 2) each affiliate owns at least 10 percent. France has a similar rule, but the single-ownership threshold is 5 percent. In total, there are six OECD member states with such hybrid systems. Some countries utilize only a single-ownership test. South Korea, for example, considers a subsidiary a CFC if only more than 10 percent of its share capital is held by a single domestic corporation. In Sweden, a foreign subsidiary is considered a CFC if a single shareholder owns more than 25 percent of its shares. Of the OECD countries with CFC rules, eight employ a single-ownership test. Other countries, such as New Zealand and Australia, use an either-or-approach. In both countries a foreign entity is deemed “controlled” if either a single company owns more than 40 percent of the shares or five or fewer corporations own more than 50 percent of the shares. Some countries use more qualitative assessments to determine CFC status. Mexico considers any foreign corporation where domestic entities have “management control” to be a CFC, and Chile considers foreign corporations to be CFCs when a domestic company has the unilateral power to alter the foreign corporation’s bylaws. New Zealand and Australia also use a qualitative control standard. While many foreign corporations might qualify as a CFC, not all will be subject to domestic taxation. There are generally two ways in which countries determine whether CFC income is taxable by domestic tax authorities. The first way is through a “taxation condition.” This standard is aimed at preventing profit shifting to low-tax jurisdictions, or “tax havens.” The classification of tax havens is usually based on the effective corporate income tax rate levied against the CFC or a “black” or “white” list. Generally, a standard threshold is utilized to determine if the tax rate in the CFCs country of residence encourages tax avoidance. The threshold can either be an arbitrarily determined rate, or a metric comparing the CFC’s taxation abroad to the treatment it would receive as a domestic enterprise. For instance, Mexico enforces CFC restrictions if the CFC pays an effective rate that is less than 75 percent of the Mexican statutory corporate income tax rate. Eighteen countries subject CFCs to regulation based on a taxation condition. The second way in which countries determine whether CFC income is taxable is by analyzing the type of income earned by a CFC. There are two main categories that business income can fall into: active and passive. Active income arises from traditional production activities, whereas passive income comes from legal or financial activities. Passive income in most countries usually includes interest, dividends, rental income, and royalty income. Countries that use income tests typically tax CFCs if a majority of their revenue is derived from passive income. Fourteen countries use the percentage of total income derived from passive sources as a benchmark to determine whether CFC rules apply to an entity. The benchmarks diverge enormously. New Zealand applies CFC rules if passive income is greater than 5 percent of total CFC income, whereas Poland applies CFC rules if passive income is greater than 50 percent of total CFC income. A few countries also have further conditions they use to determine whether a CFC is taxable. Some countries, like Turkey, will only apply CFC rules in cases where the foreign corporation has assets exceeding a certain value. The United Kingdom has several potential tests it uses, including length of share ownership and the foreign company’s profit margin. Other countries will only tax a CFC’s profits in the hands of its parent if the parent company owns a certain amount of the CFC’s shares. For example, Finland will only tax a CFC’s income if its domestic parent owns at least 25 percent of its shares. Once a country’s CFC rules determines that a company’s CFC’s income is taxable domestically, the rules then define what income is subject to tax. These rules also vary significantly and can apply to a share of passive income or both active and passive income. Of the countries with CFC rules, 11 countries only tax passive income earned by CFCs while 14 countries impose taxes on both active and passive income of CFCs. 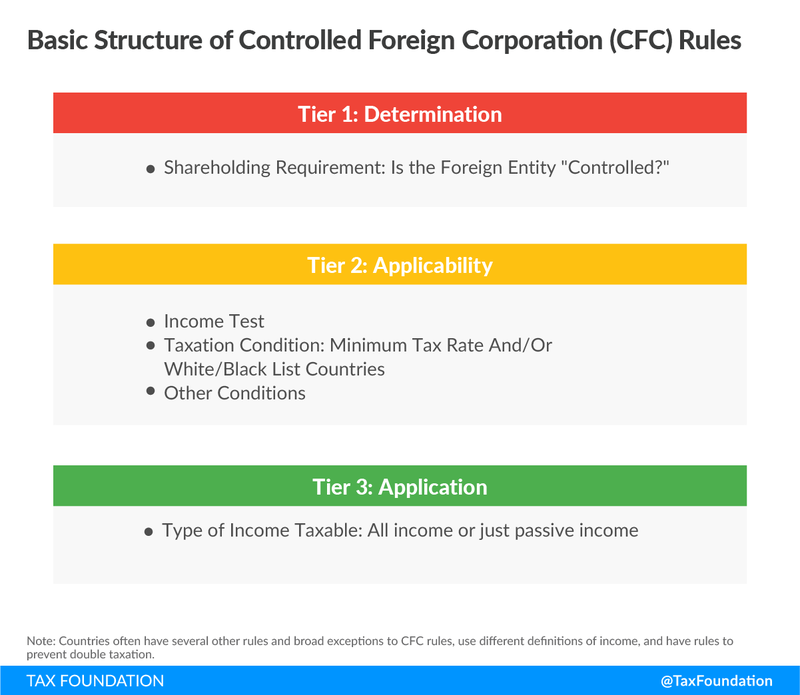 In addition to these general rules, nearly every country has exemptions that determine when a CFC may not be subject to these rules or taxation at all. In accordance to an EU ruling, all EU countries have rules that exempt CFCs operating in other EU and EEA countries from domestic taxation as long as they are engaged in real economic activity. Non-EU countries such as Japan and Korea have similar active business exemptions. Other countries, such as Finland, Sweden, and Chile exempt CFCs if they operate in “white list,” or treaty countries. Some countries may exempt CFCs if their profits are below a de minimis threshold. Besides exemptions, countries also have provisions that seek to prevent the double taxation of income that has already been taxed through a CFC rule when repatriated. Under most tax systems throughout the world, the interest corporations pay on loans and bonds is deductible against taxable income, while interest income is taxable. It is common practice for a multinational corporation to lend itself money, by providing loans to and from subsidiaries located in foreign countries. These cross-border loans are helpful for companies to expand and make new investments in foreign markets. However, as with other deductible expenses, interest deductions can be used to exploit cross-country differences in corporate tax systems to reduce corporate tax liabilities. Multinational corporations have an incentive to take out loans in high-tax countries, where they can take deductions, and lend from low-tax countries, where they can realize interest income, resulting in a lower worldwide tax burden. Interest deduction rules can be seen as a supplement to CFC rules. CFC rules apply only to resident corporations whereas interest deduction limitations apply to all corporations—foreign and domestic. To combat potential abuse of interest deductions, countries place limitations on these expenses. Twenty-nine of the 35 OECD nations place some sort of formal limitation on interest expense deductions. Austria, Ireland, and Luxembourg have informal limitations on interest deductions. The only countries that do not have any widely applicable limitations on interest deductions are Estonia, Israel, and the Netherlands. In the United States, the rules governing interest deduction limitations can be found in the Internal Revenue Code under §163(j). 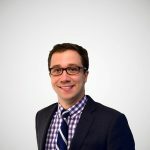 Interest deduction limitations are often implemented through rules specifically targeted at multinational corporations, called thin capitalization rules. Thin capitalization rules target companies whose debt levels far exceed equity. The majority of these rules are designed to apply when a company has a debt-to-equity ratio beyond a predetermined threshold. Of the 22 OECD nations using thin capitalization rules, 17 members employ this method. Luxembourg and Austria do not have explicit thin capitalization requirements, but tax authorities in those countries also use the debt-to-equity ratio as a tool to evaluate whether interest deductions will be restricted. A few countries with debt-to-equity-style thin capitalization rules also pair them with restrictions on interest deductions to a set percentage of income. Eight OECD countries with thin capitalization requirements use this rule, with France, Poland, and the United States employing this restriction in conjunction with a debt-to-equity ratio. In recent years, countries have introduced much broader interest deduction limitations. These limits are sometimes called “earnings stripping” rules and restrict interest deductions to a set percent of income. Five countries have these rules. For example, Germany limits corporate interest deductions to 30 percent of income. The remaining OECD members with restrictions on interest deductibility employ more qualitative assessments. Generally, these assessments examine the intent and fairness of intracompany loans. Specifically, the loan must be made for a clear commercial purpose and must have interest obligations similar to those that would be offered by a third party. Sweden, for example, denies deductions if the interest on the loan is taxed at less than 10 percent, if the loan does not serve a commercial purpose, and if the loan would not have been made by an independent third party. There have been two major proposals to move the United States to a territorial tax system in the last couple years. At the same time, both proposals would enact significant changes to the U.S.’s anti-base erosion rules. However, there are significant differences in how they would work. In 2014, Representative Dave Camp (R-MI) introduced a comprehensive tax reform proposal. His proposal would have reformed the corporate income tax by moving to a territorial tax system. Additionally, the proposal would strengthen anti-base erosion provisions, mainly aimed at intangible income, or income derived from intellectual property (IP). Similar to many systems in the OECD, the Camp proposal would enact a 95 percent dividends received deduction in order to move to a territorial tax system. His plan would also reduce the corporate income tax rate to 25 percent. The Camp plan would also alter Subpart F, the United States’ CFC rules, in a number of ways. The most significant change is called “Camp Option C.” This proposal would add an income category to Subpart F aimed at taxing foreign income derived from intellectual property. The rules would attempt to accomplish two goals. First, it would attempt not to put companies operating on foreign markets at a competitive disadvantage by putting all IP used in connection with foreign sales on a level playing field. Under this rule, income attributed to IP located in foreign jurisdictions or the U.S. used in connection with sales to foreign customers would be taxed at a minimum rate of 15 percent. This means that as long as a company is selling goods to foreign customers using IP, that IP income would be subject to the same U.S. tax rate. Second, it would attempt to prevent companies from using IP from eroding the U.S. tax base by putting all IP used in connection with domestic sales on a level playing field. It would do this by subjecting IP income earned abroad in connection with domestic sales (sales to U.S. customers) to the full U.S. tax rate (25 percent in the Camp proposal). As such, IP in Ireland or the U.S. used to sell goods or services directly to U.S. companies would face a 25 percent U.S. corporate tax rate. Under the minimum tax, the United States would collect a tax on foreign earnings equal to the difference between a 19 percent rate and 85 percent of the effective rate paid by the company in the foreign jurisdiction, not to go below zero. This proposal would be introduced in addition to changes that strengthen existing Subpart F rules. For example, a CFC located in Germany may face an effective tax rate of 30 percent. Under this proposal, the calculation would yield a rate below zero. As such, the company would face no additional tax in the United States. In contrast, take a CFC located in Ireland, which could conceivably face an effective tax rate of 10 percent. The same calculation would yield a rate of 10.5 percent owed to the United States. As with CFC rules in other countries, the Obama minimum tax proposal would apply to foreign income on an annual basis, without deferral: companies subject to the minimum tax would face U.S. tax liability in the same year in which they earned the income. A unique feature of this proposal is that it would exclude a significant amount of foreign income from taxation through what is called an “allowance for corporate equity” (ACE). This allowance would be calculated by taking the equity of a CFC located in a foreign jurisdiction and multiplying by an interest rate. A company would then take its total foreign profits and subtract this ACE to derive the profits subject to the minimum tax. The purpose of the ACE is to exempt “normal” returns on foreign investments from domestic taxation while taxing “super normal” returns, which may reflect returns from profit shifting. In recent years, countries have begun to introduce rules to aggressively pursue profit shifting by multinational corporations. Some of these new provisions were developed as part of the OECD’s base erosion and profit shifting (BEPS) program. For example, countries have started introducing country-by-country (CbC) reporting, which requires companies to report to tax authorities information such as profits, sales, number of employees, and taxes paid in each country they operate in. Some countries have also introduced an anti-base erosion provision called a “diverted profits tax.” A diverted profits tax, or a “Google Tax,” as it’s called in the United Kingdom, basically sits on top of all the other anti-base erosion rules and is meant to target specific transactions that tax authorities deemed to be abusive. The application of the tax in the United Kingdom, specifically, is complex and somewhat subjective in nature. A diverted profits tax has also been introduced in Australia. For the past year, most of the corporate tax debate has centered on whether the U.S. should do away with the corporate income tax entirely and enact a destination-based cash-flow tax (DBCFT). If lawmakers decide not to enact a DBCFT and decide to keep and reform the corporate income tax by enacting a territorial tax system, there are a number of issues they still need to address (besides what revenue offsets would replace the border adjustment in a revenue-neutral tax reform). Looking at rules throughout the developed world, it is not clear that there exists a “perfect” or pure territorial tax system. This isn’t because a territorial tax system is a bad idea. Rather, it is because the taxation of corporate profits is fundamentally challenging. Thus, countries needed to make a number of trade-offs in designing their systems. It is really only possible to accomplish two of these goals at the same time. U.S. lawmakers will need to balance these competing goals if they decide to enact a territorial tax system. Lawmakers may opt to enact the most competitive territorial system possible, but may need to trade the ability to perfectly protect the U.S. tax base, if they do not want to enact complex rules. This is especially the case if the statutory U.S. corporate tax rate remains well above the average rate among our largest trading partners. No country in the OECD has a pure territorial tax system with no limits or restrictions. However, there are systems with fewer rules than others. The Netherlands, for example, does not have any official CFC rules or interest deduction limitations. However, it does limit its participation exemption if tax avoidance is suspected. In contrast, lawmakers could opt for a more blunt solution to tax avoidance, such as a minimum tax on foreign profits, but need to understand that this may have a disproportionate impact on certain industries and would not eliminate the incentive for companies to invert. Systems like this would be similar to what former President Obama proposed or what exists in countries with broad CFC rules, like Australia and New Zealand. Corporate taxation is inherently complex, and regardless what reform is pursued by lawmakers, there will be trade-offs. By no means does this mean that a territorial tax system is not worthwhile. It would certainly be an improvement over our current worldwide system of taxation. However, it is important to stress that moving to a territorial tax system requires thought about what type of system to enact and what rules go along with that system. A territorial tax system would certainly be an improvement over our current system. However, these systems often require complex rules to define taxable profits and prevent base erosion and profit shifting. All OECD nations that have moved to a territorial tax have rules to prevent base erosion, but their structure varies significantly. Lawmakers looking to move to a territorial tax system will need to carefully consider how to structure such a system for the United States. It may strike some as odd that the United States taxes the profit from a factory in Slovenia that makes cars, using Slovenian machinery and workers, that are sold exclusively to Slovenians. Some countries also have provisions that can redefine income as taxation passive income if abuse is suspected. The Obama administration proposed a number of changes to Subpart F including changes to ownership thresholds and the creation of a category of Subpart F, “foreign base company digital income,” which would tax income from the sale or lease of digital products. Ibid.